Despite my best planning and rampant enthusiasm for the evening’s billing, I almost didn’t get into the show last Saturday. Due to some mix-ups on the back end, my name was never added to the press list. I waited outside the venue asking strangers for extras (shhh! scalping is illegal!) for over half an hour and was about to give up when I met two helpful gentlemen with a few extra badges to share. Hooray for the kindness of strangers! At the end of the night, the s***-eating grin that plastered my face told me I wasn’t a fool for standing out in the cold alone in the Tenderloin waiting for a miracle at a sold out show. 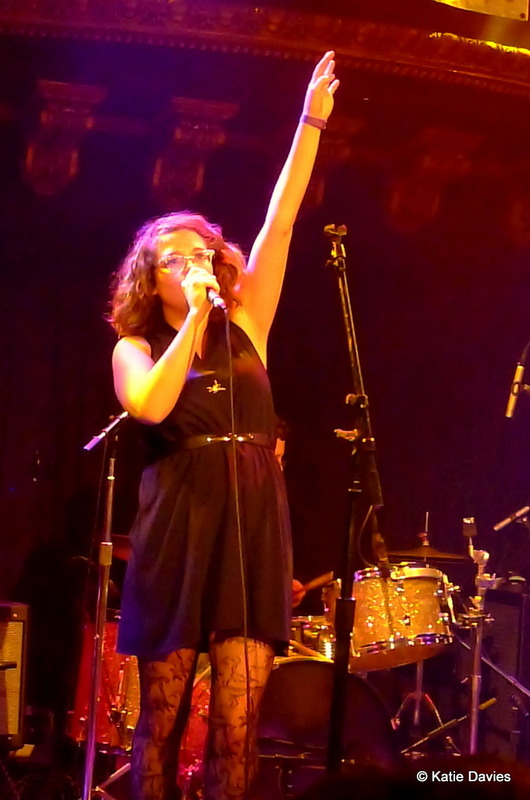 Saturday night’s Noise Pop show at the Great American Music Hall had a really strong lineup. It was the sort of evening where each band’s unique style seemed to complement each other and also offered a little something for everyone. Of our group of three, we all had different bands on the bill that brought us to the show, we each walked away with a different favorite set, and none of our favorites were the ones that inspired us to buy tickets in the first place. Starting things off was Kacey Johansing (whose set I unfortunately missed while ticket hunting), then Before the Brave, followed by Sallie Ford & the Sound Outside and headlined with the fantastic Thao & the Get Down Stay Down. The Get Down Stay Down took the stage, kicking off the opening music to “We Don’t Call,” and Thao Nguyen sauntered up shortly after, greeting the crowd with a contented “Hello, my home.” What followed should make any San Franciscan proud to be claimed by this firecracker band leader. Throughout the set, Thao showed her versatility by rocking her oversized acoustic/electric guitar, banjo, mandolin, and slide guitar, all the while bringing passion and personality to her music and the stage. Seeing a local band grow and find success brings a sense of camaraderie and pride to its fans, a feeling that was in no short supply on Saturday. Further evidence of this came when Thao congratulated a couple in the audience that had met at one of their previous shows and got engaged that night. It was a sweet and appropriate sentiment that led into one of my favorite songs off the new album, We the Common, “Holy Roller.” The band components ebbed and flowed throughout the set, sometimes including horns, marimba and background vocals, while other times stripping down to the basics of Thao in front, drums, bass and keyboard, showcasing the thoughtful arrangements for each song. 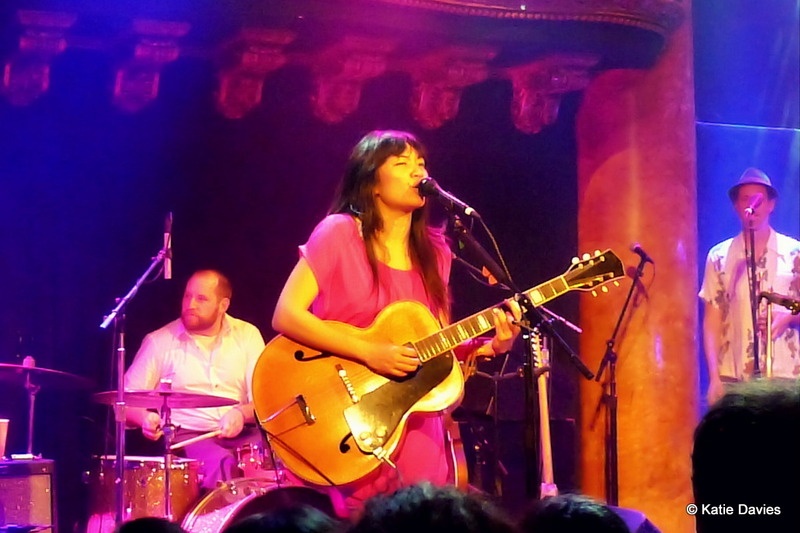 Thao also took a moment to acknowledge her work at the California Coalition for Women Prisoners, citing it as an inspiration for the latest album. The title track of the new album is indeed dedicated to Valerie Bolden, a female prisoner serving a life sentence without the possibility of parole for fatally stabbing her husband in 1996. Before playing the title track, Thao reminded the audience that we’re all in this world together and should be watching out for each other. She wrote an essay on some of the other women she’s worked with through the CCWP here and collected donations for the organization at the door after the show. Set highlights include, “City,” “Move, “The Day Long,” “Age of Ice,” “We the Common (For Valerie Boden),” “Every Body,” and “Squareneck.” A pipe-dream wish of mine was fulfilled during the encore, “Body.” When the lyric “It’s good to see you/ too good to see you” came on, none other than tUnE-yArDs’ Merrill Garbus graced the stage to wail her back up notes that she contributed when the album was recorded. Before playing “Every Body,” Thao confessed that it was,“the only love song I’ve ever written, and it’s about all of you.” The feeling is mutual, Thao. Sallie Ford & the Sound Outside hail from Portland, OR, a fact which would surprise no one who has seen them perform. Their retro, rockabilly sound is matched by their throwback style and quirky stage banter. When Sallie Ford isn’t wielding her seafoam green electric guitar, she’s clutching her horn-rimmed glasses to her face while head banging and twirling her arms around in rhythm with the music. Her guitarist brings some seriously bluesy and skilled chops to the mix, and their sound and style work very well together. Their set was almost entirely off the new album, Untamed Beast. While I understand their need to promote the new stuff, and I’m sure they played their debut Dirty Radio endlessly on their first tour(s), I still would have liked to hear a more balanced setlist. She played only one song from their first album (“I Swear”)! Sallie Ford & the Sound Outside will be appearing with Thao & the Get Down Stay Down for the remainder of their tour. Dates are available here. The first band I saw of the evening was Before the Brave, another local act that has only been on the scene for about a year. Their sound closely mirrors Head and the Heart, The Lumineers and Of Monsters and Men, a pretty trendy blend of Americana, folk and indie rock. They were genuinely elated to play GAMH with such a solid lineup, and their sweet duet titled “Poet’s Vision” was really endearing. Not to mention they have some pretty badass (and generous!) friends… Before the Brave doesn’t have any shows scheduled at this time, but you can give their tunes a spin here.